Anatherum virginicum , (L.) Spreng. Andropogon virginicus , L. var. tetrastachyus (Elliott) Hack. Andropogon virginicus , L. subvar. typicus Hack. Andropogon virginicus , L. var. viridis Hack. 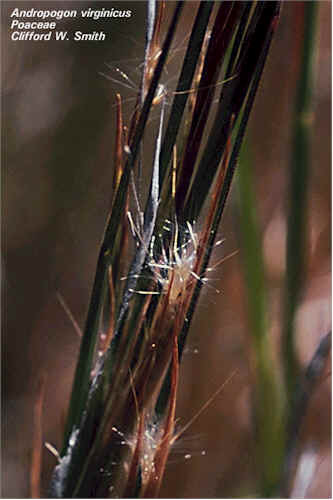 Andropogon virginicus , L. subsp. genuinus Hack. Andropogon virginicus , L. subvar. genuinus Hack. The perennial bunchgrass (Andropogon virginicus) commonly known as broomsedge sometimes forms continuous cover in boggy, open mesic or dry habitats. It releases highly persistent allelopathic substances which inhibit competition. The dead material provides an excellent fuel for fires, and further it is fire-stimulated, increasing cover dramatically with each fire. A serious problem in Hawai‘i - major infestations occur on the windward plain and Pupukea areas of O'ahu, overgrazed ridges in east Moloka'i, and the Puna and Ka'u regions, (PIER, 2003). On French Polynesia exclusion list, (PIER, 2003). Because it retains the phenology of its native habitat, the southeastern United States, its growth is out of synchrony with Hawaii's climatic pattern. It is dormant during the rainy season, which leads to increased erosion in some areas (Mueller-Dombois, 1973 in Smith). Flowering begins when plants are 2 or 3 years old, and continues thereafter (Uchytil, 1992). Subhumid to humid subtropical areas on a wide range of soils, (PIER, 2003). From sea level to 1,600m in Hawaii, (Smith). Dried material contributes to fire hazard, and reproduction is encouraged by fire, (PIER, 2003). On infertile soils (low in nitrogen or phosphorous), A. Virginicus acts as a long-lived competitor, (Uchytil, 1992). Work in Tennesse showed broomsedge to have an average lifespan of 3-5 years and that all plants died within 7 years. 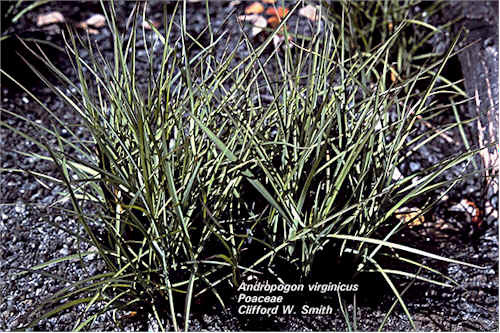 Recommended citation: Global Invasive Species Database (2019) Species profile: Andropogon virginicus. Downloaded from http://www.iucngisd.org/gisd/species.php?sc=200 on 20-04-2019. This perennial bunchgrass sometimes forms continuous cover in boggy, open mesic and dry habitats. It releases highly persistent allelopathic substances (Rice 1972, In Smith). The dead material provides an excellent fuel for fires. It is fire-stimulated; its cover increases dramatically with each fire (Smith, Parman, and Wampler, 1980, in Smith). In areas where it occurs, both fire intensities and acreage burnt have increased, (Smith). Work in Oklahoma in the US showed no change with a single spring burn, an increase with two spring burns, and that it was drastically reduced with a summer or fall burn when soil conditions were dry. Andropogon virginicus invades forest and other native vegetation, along tracks, (ESC, undated). Nearly pure stands can persist as a result of competition and allelopathy, (Uchytil, 1992). Preventative measures: A Risk assessment of Andropogon virginicus for Australia was prepared by Pacific Island Ecosystems at Risk (PIER) using the Australian risk assessment system (Pheloung, 1995). The result is a score of 13 and a recommendation of: reject the plant for import (Australia) or species likely to be a pest (Pacific). Informations on Andropogon virginicus has been recorded for the following locations. Click on the name for additional informations. PIER (Pacific Island Ecosystems at Risk), 2003. Andropogon virginicus. Uchytil, Ronald J. 1992. Andropogon virginicus. In: U.S. Department of Agriculture, Forest Service, Rocky Mountain Research Station, Fire Sciences Laboratory (2002, September). Fire Effects Information System. Summary: Distribution and occurence in the US, value and use, botanical and ecological characteristics, fire ecology, fire effects, references. Available from: http://www.fs.fed.us/database/feis/plants/graminoid/andvir/all.html [Accessed 18 Nov 2002]. Eurobodalla Shire Council (ESC), Whisky grass (Andropogon virginicus). Eurobodalla Shire Council, Australia. Summary: Description, habitat and impacts, dispersal, look-alikes, control. 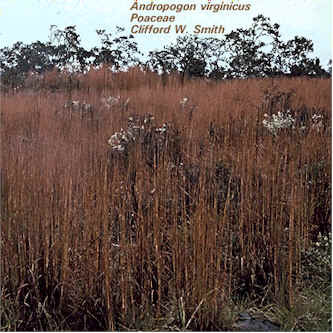 Smith, W. Andropogon virginicus. Hawaiian Alien Plant Studies. University of Hawaii, Botany Department. Summary: Brief description of A.virginicus and impacts in Hawaii. Available from: http://www.botany.hawaii.edu/faculty/cw_smith/and_vir.htm [Accessed 5 Nov 2002].